How will you build on the work and relationships developed up to now? What would you like to achieve as the Marine CoLAB team? How will you know that you have achieved it? How will you organise yourselves in order to achieve it? 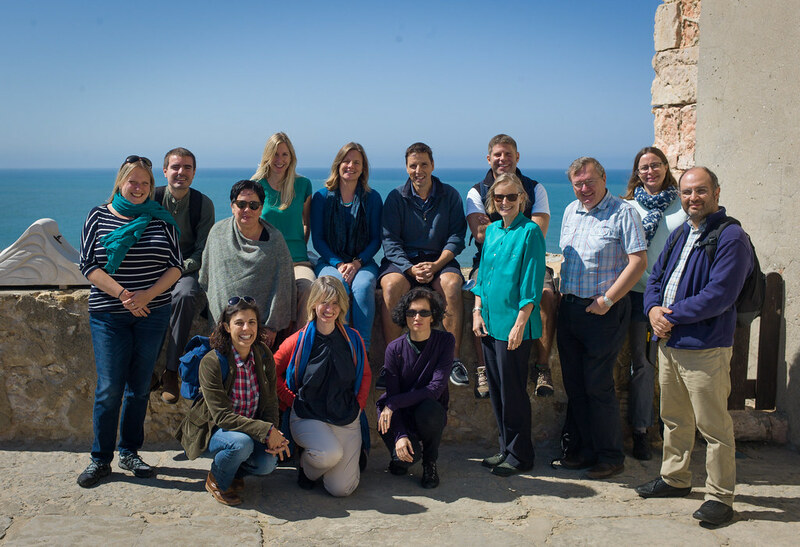 A field trip to Portugal could seem as a luxury, but spending time together as a team in a different context can be essential for bringing the group closer together and advancing the vision and specific projects. Being with each other in formal sessions, on the bus and socialising before and after the sessions allowed the participants to get to know each other in a range of situations and hear about different aspects of their work and life. The first session in the lighthouse of Nazare introduced the participants to the Portugese marine conservation context. 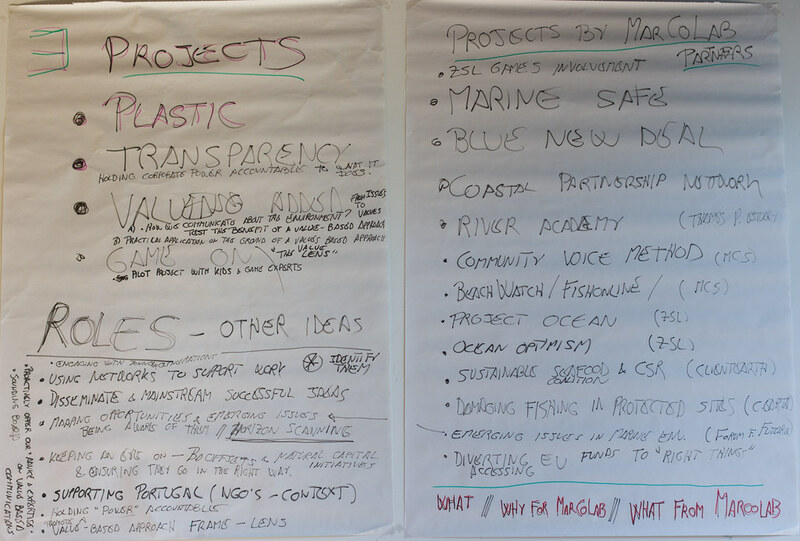 It provided time to think about what the participants wanted to achieve as Marine CoLAB in general, as well as specifically discuss what the purpose of the Lab sessions on Thursday would be. Catarina Grillo welcomed Marine CoLAB and described the context within which the Gulbenkian Oceans initiative (GOI) operates. She talked about the importance of the blue economy, in a country suffering from the economic crisis and decrease of investment, including connecting to European maritime and fisheries funds. GOI is specifically focusing on the value of marine ecosystem services, and connecting social and natural sciences. They work with a range of organisations, some of whom we had a chance to meet. The Portugese marine NGO sector is very small, primarily project-based with a maximum of 20 people employed, the rest driven by volunteers. While it is wonderful to have many volunteers involved, this creates a challenge of continuity in the mid term, without much institutional memory. The small size of the sector also has its benefits: it can be agile, as everyone knows each other (a good example is PONG Pesca). The sector began with a need to get a seat on the table on the common fisheries policy. Now there is a bigger group of marine biologists who essentially do everything themselves. In the UK, the sector grew exponentially in the last 10-15 years. 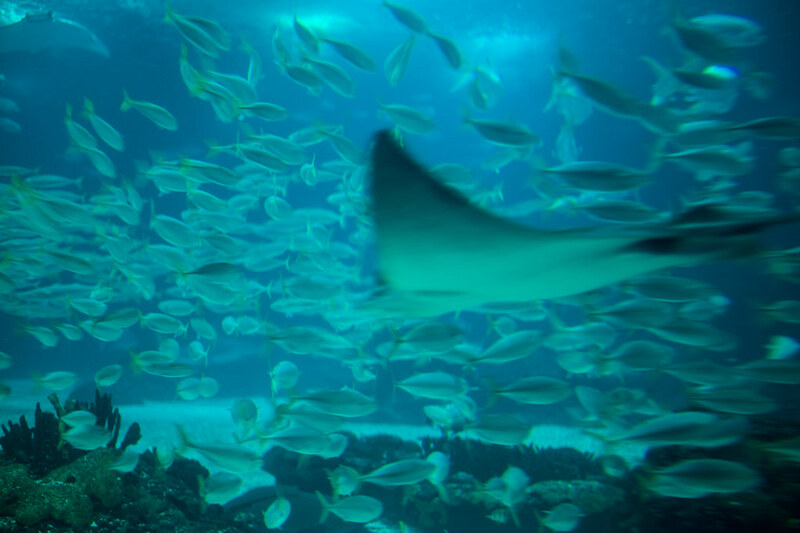 The main difference is in the growth of the support services (fundraising, communication…), where marine conservationists had to learn to work with other skillsets to make projects happen. Skills and funding in the Portugese marine NGO sector need to be diversified. Funding should not be driving the direction of the sector, there should be more of a feedback-loop between the funding and delivery, in response to real needs. Participation is another challenge the sector is dealing with. There isn’t much environmental awareness and the extent of participation tends to be limited to signing petitions. Non-participation is a cultural problem linked to Portugese dictatorship, which ended only 40 years ago. An encouraging aspect of Portugal is that the oceans is seen as a cultural value, it is embedded in cultural traditions for centuries. This means that there is a lot of media attention for fisheries and other marine services related issues. Good to exchange with Portugese NGOs in their 'native environment'. Disconnect: realisation that even though the Portugese sector is small, it is still quite disconnected. The participants emphasized the value of exchange and connection between the NGOs, between the fishermen and the communities, as well as connecting marine conservation with other sectors. There is a perceived disconnect in values, which is unsustainable in the long run. For example fishermen don’t express the value of the place; they feel threatened by NGOs, which might distort the collected data. Realisation that a more holistic values based approach might help to bring marine issues closer to people who don’t understand or don’t care. Challenges in the Portugese and UK sector are similar. Marine CoLAB could offer mentoring to the Portugese sector, in order to encourage leapfrogging. 10:30 - 11:30 Incubator project pipeline (existing and individual projects). Outcome: list of projects, decision: continue, postpone, abandon. how do we communicate about the environment? e.g. ZSL anti poaching add-on to minecraft, angry birds pangolin. Plastic is an extremely useful material. It is light, cheap to produce and very durable, but these strengths are also its weaknesses, particularly when it ends up in the sea. Plastic pollution is recognised as one of the most significant and growing threats to ocean health. Eight to 13 million tonnes of plastic go into the ocean every year and by 2050 it is estimated humanity will have produced 33 billion tonnes of which 10-15% will be in the ocean. The problem is pervasive, with every part of the ocean now affected, negatively impacting people, the environment and the economy. 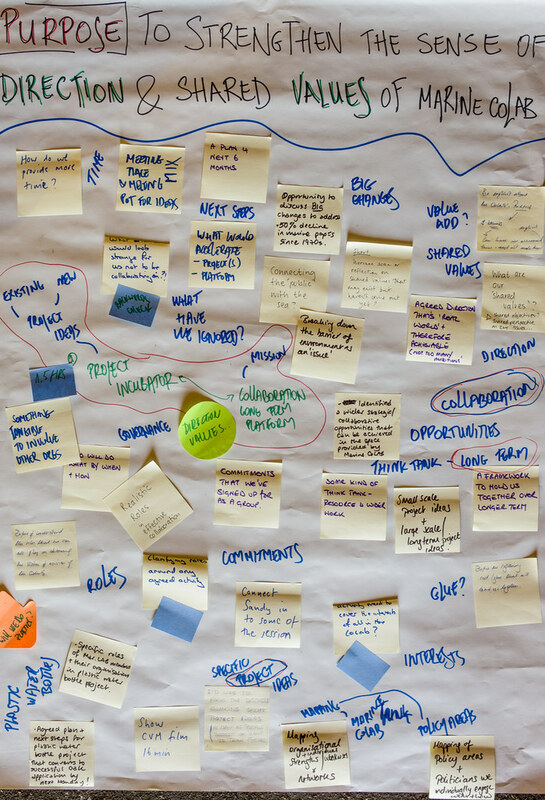 A variety of solutions are emerging, but the issues are complex and a systemic approach is needed targeting values, behaviour, design, policies and systems in/for industry, government and the general public to create significant, lasting change. Though one of the easier forms of pollution to deal with, plastic bottles remain a highly visible component of marine litter and in a country like the UK, with safe water in our taps, the one-off use of plastic for drinking water seems particularly egregious. Our goal is develop, implement and assess the impact of an innovative London-wide campaign to make London single-use-plastic-water-bottle free, seeking change through a holistic and multi-targeted approach. Using the simple symbol of a plastic water bottle, we aim to connect people to the ocean and change their perceptions, values and behaviour, reducing the number of plastic bottles entering the ocean. 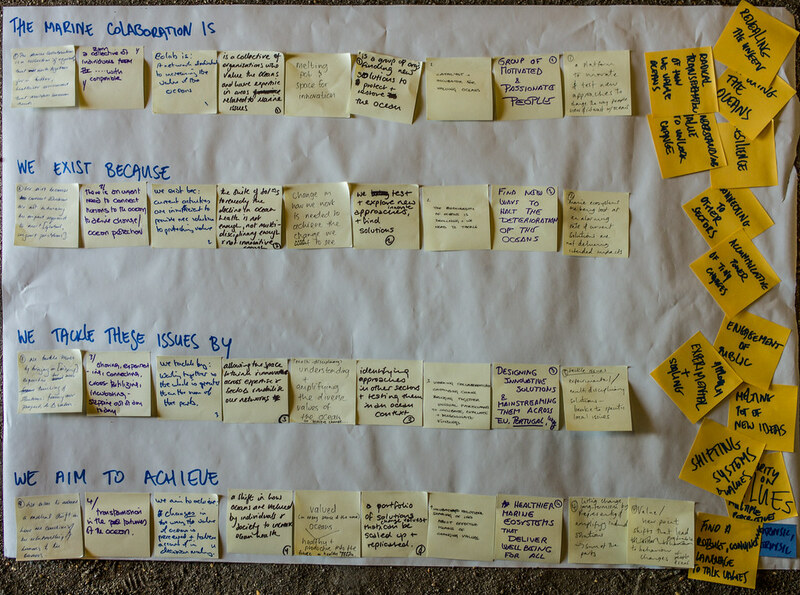 Through systems-mapping and analysis, we aim to identify and tackle areas that require priority action to change. We will coordinate and catalyse existing disparate efforts to generate a ground swell of change, focused around plastic bottle pollution in the ocean. We will tackle local mechanisms to reduce plastic pollution entering the ocean from London that can be replicated globally. Our approaches aim to catalyse transformational changes in the way oceans are perceived resulting in a more socially and environmentally sustainable society. We tackle this as a collaboration of 9 NGOs working closely with the Calouste Gulbenkian Foundation. The project team has relevant expertise and networks and is focused on a solution-based approach. This complex and big idea has an experimental element with risks involved, but we believe we can catalyse broad-scale change. A campaign to reduce the use of single-use plastic water bottles in London would create a strong iconic focus and clear agency for individual/organisational action, giving traction to the issue, complementing the existing initiatives and organisations working in the marine litter space, and promoting innovation. This will take a complex global issue and make it local and personal, engaging people’s imagination and thought processes on the bigger issue of single use and the marine environment. Marine plastic pollution is a global problem needing locally appropriate solutions. Innovation is increasingly happening at a city level and is often competitive. This project enables London to lead on what could be replicated in cities worldwide and build on its global position in business, media, innovation, design, culture and sport. At the heart of London lies the iconic, tidal river Thames – an actual, historical and metaphorical connector of the city to the sea. This means we have an opportunity to connect plastic litter on London streets to an ocean issue – in one of the world’s leading cities. Current uncoordinated systems are ripe for change and maximising economies of scale e.g. 26 London Boroughs each has their own waste management and collection systems. The concept emerged from a series of Marine CoLABoration discussions exploring the critical issues facing the ocean, levers for change, and how/where LAB members should focus their expertise and networks to deliver step-change, with outcomes beyond the reach of any one organisation. The concept was initially tested with experts at the Economist World Ocean Summit and the Plasticity Forum in June 2015, and explored with an expert panel and audience at Selfridges department store in London during its Project Ocean events, which this year focused on marine plastics. LAB members worked closely with Selfridges who removed single-use plastic water bottles for the Project Ocean launch in July 2015, attracting significant media attention. For more information see "A sea change" document collated by Heather. Monday, 28th September: Submit plastics funding application to Oak. Heather to co-ordinate, All to contribute: how do you want to be involved, what time and budget do you need? Heather will upload an editable document to google docs, all are welcome to comment and edit. Games: Collect views and knowledge on games. All to send what they think and know to marine-colab@fo.am. Sandy to collate. What is the project (elevator pitch)? Why is it relevant to Marine CoLAB (what can it offer)? What does it need from Marine CoLAB? Research into global collaboration platforms. Giles to share, all to test. 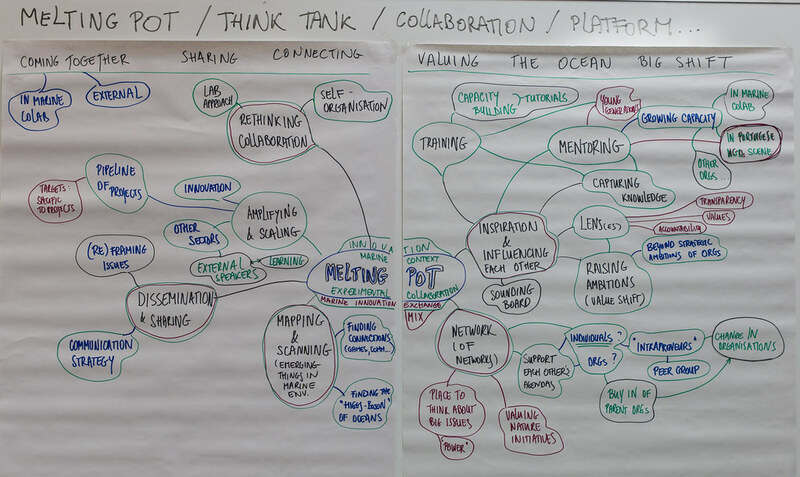 The Future of Marine CoLAB: Think about what you would like to happen (LAB sessions, working groups, projects, network, etc. , what resources might be needed, etc. Decide on dinner speaker(s): Louisa to co-ordinate. Future of Marine CoLAB (for 2016 and beyond). This information is needed to allocate funds from the gulbenkian budget in 2016 - They need to know what will happen with marine CoLAB, how it will develop, what LAB sessions might happen, what resources are needed etc. Louisa to structure the session. The participants are grateful for the whole experience, which they feel has brought them further quicker than in one-day workshops and has forged stronger bonds between the participants. Informal socialising and time to have in-depth conversations is much appreciated. The time on the bus allowed the participants to talk to each other at length outside of the formal sessions. Breakfasts, dinners, taxi rides, walks between places had a similar effect of social exchange and bonding. Being outside by the ocean that everyone cares about has provided a boost of energy and an emotional connection to what marine CoLAB is really about. The value of different types of shared experience (e.g. Oceanario, the underwater forest exhibition) allows the participants to reflect on their own practice and Marine CoLAB as a whole. It reminded the participants how important it can be to be patient.